February 2, 2014  The skydiver who set world records for the highest and fastest jump plunged from a balloon capsule 24 miles up and broke the sound barrier on his way down. October 14, 2012  Felix Baumgartner lept 24 miles from the stratosphere and landed gracefully just more than nine minutes later in a desert in Roswell, N.M., Sunday. October 10, 2012  It's been a tough week for daredevils. 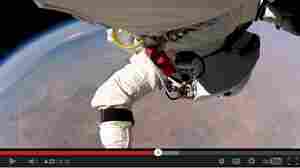 Felix Baumgartner had to postpone his bid to break the speed of sound during a skydive. 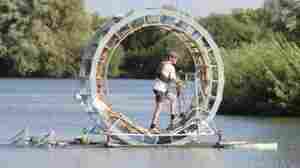 Chris Todd had to give up his hamster-wheeling walk across the Irish Sea. His machine sank.